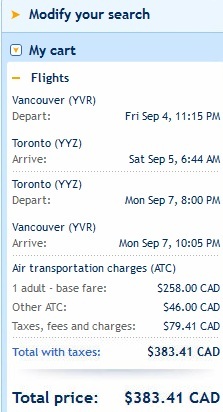 Vancouver to Toronto - $384 roundtrip including taxes, even during summer! WestJet has just dropped the price on a ton of their flights from Vancouver to Toronto. Typically this is a route where prices don't drop much below the $500s, and also a route where our nation's two airlines don't usually like to lower their prices. What's even more amazing is that summer travel dates are available, a time period where flights are generally even more expensive. The flights are non-stop. Update 1 - June 10 @ 12:30 PM PST - they're back! Update 2 - June 10 @ 2:11 PM PST - looks like WestJet has put them back up into the $600s. That was short-lived! For live discussion of this deal, or to get some amazing travel advice from over 20,700 real travelers in Vancouver, join the YVR Deals Facebook Group. vancouver, yvr, flight deals, westjet, toronto, ontario, yyz, canada, north america and eastern canada. 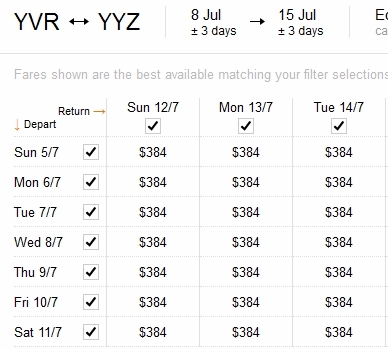 11 Responses to "Vancouver to Toronto - $384 roundtrip including taxes, even during summer!" Took advantage this for a June trip. Thanks very much, Chris! Hmm, is it me or the prices are for each way?? I don't see these deals. I'm getting about 430 each way. what am I doing wrong? You might be too late. This alert was sent 4 days ago. Are you signed up to receive the alerts ? Can I still get the deal round trip vancouver to Toronto? Thanks Kelsey, glad to hear it ! The deal is back up on the westjet site!